Chances are if you are reading this post,you have either bought the Clarisonic already or atleast thought about it at some point of time. Though I give a clean skin utmost importance,I don't believe skin cannot stay clean without the usage of an electronic cleansing system. As far as I can remember,the beauty industry insisted we should dig deeper into our pockets to buy an electronic facial cleanser by introducing Clarisonic into the market and along and after came the sister concerns. One such in question today is the Olay Regenerist Advance Cleansing System! 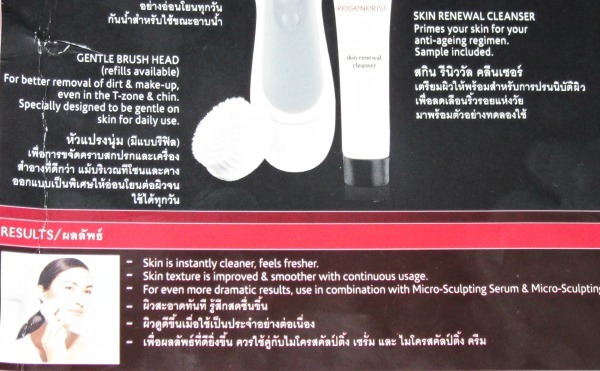 It is considered to be one of the budget versions of Clarisonic! Skin is instantly cleaner, feels fresher. Skin texture is improved & smoother with continuous usage. For even more dramatic results, use in combination with Olay Regenerist Micro-Sculpting Serum & Olay Regenerist Micro-Sculpting Cream. 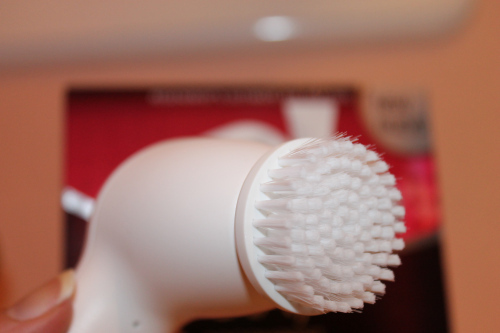 2-Speed Control delivers daily deep cleansing & gentle exfoliation. It is water-resistant for use in shower. 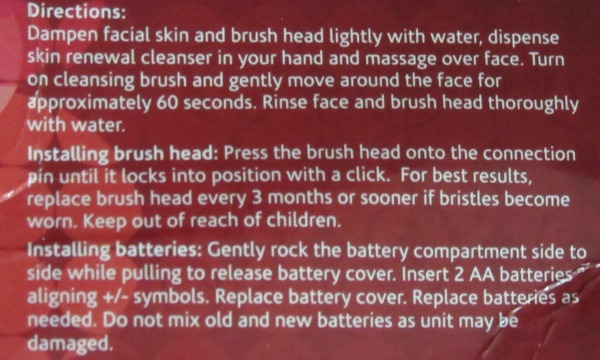 Gentle Brush Head (refills available) - For better removal of dirt & make-up, even in the T-zone & chin. It is specially designed to be gentle on skin for daily use. 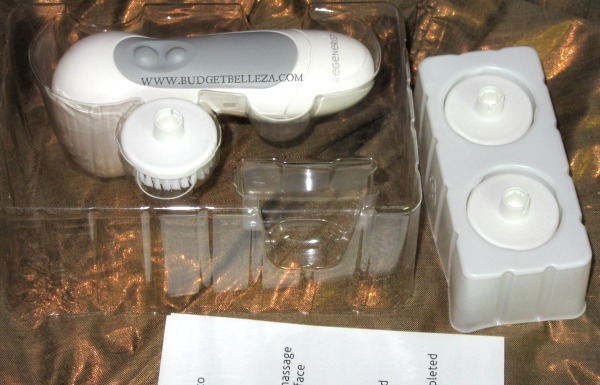 On unboxing, we get the dual speed control cleansing device,a brush head and two AA batteries. I got two detachable brush heads along with the cleansing system in the kit. I loved the packaging. Cleansing Device-The cleansing system itself is pretty light weight,handy yet sturdy. It is smaller than the Clarisonic and fits in the hands well. Super travel-friendly being cordless. 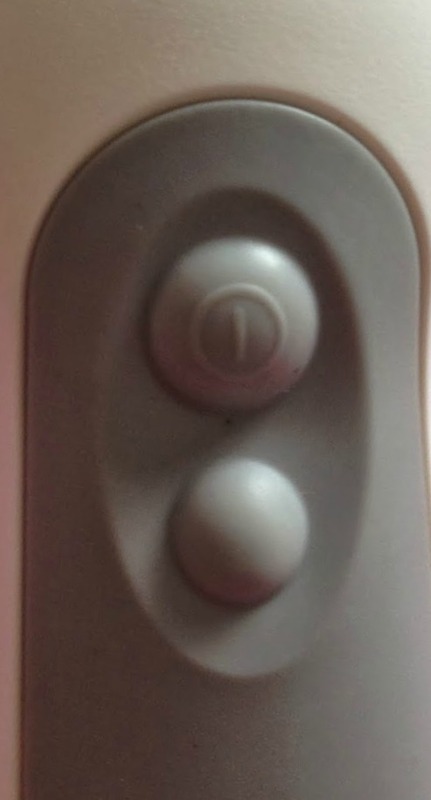 The device comes with two buttons: first one is power button and the down one offers two speed settings. Brush Head-The bristles of the brush head are very soft . They rotate 360 degrees to perfectly cleanse the skin. Cleaning the bristles isn't tasking at all. Just running under the tap water and rubbing the thumb over does the job well! 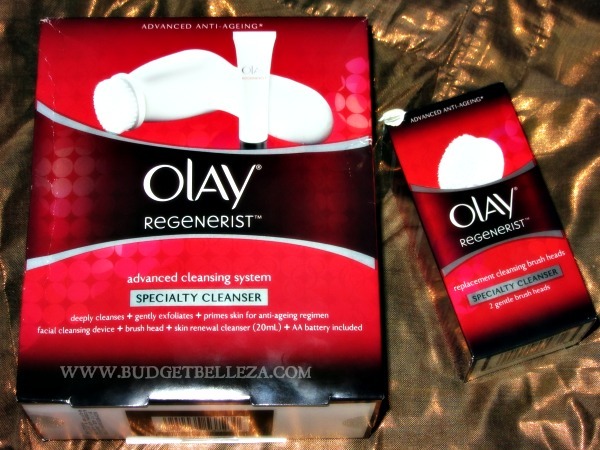 Olay Regenerist Advance Cleansing System is my first electronic cleansing device. Never thought about the need of one since I was blessed with a good/maintenance free skin. But after having kids and the growing age off course,my focus is somehow shifting towards better skin care than just makeup. It is recommended that this device is used with the Olay regenerist skin renewal cleanser but I use it with my regular Neutrogena cleanser and it works fine for me! I have had it for quite sometime now and I wanted to use it before writing a review. And now I can say that it has improved my skin quality in the sense that I don't break out at the drop of a hat since I have been using it. Also better cleansing of the skin has resulted in better penetration of moisturizers..gels..serums..face oils,thus increasing the suppleness of the skin! And though it shouldn't be taken as pros..but it gives me a facial kinda feel which is grrrrreattt! Cost effective when compared to clarisonic. Water resistant-can be used in shower. Allows better penetration of the lotions and potions used thereafter. Cant think of any cons! Seriously its just not imp.that u use only the brand recommended face wash along with the gadget..Anything that has worked well for you in the past,will do fine! 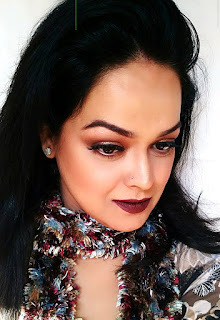 I am Aditi,a sapling in these sprawling gardens of beauty blogging. I am an artist, a dreamer, a fashion and beauty enthusiast, a to-do-list maker, an amateur photographer, an amazing cook and a fantabulous foodie.